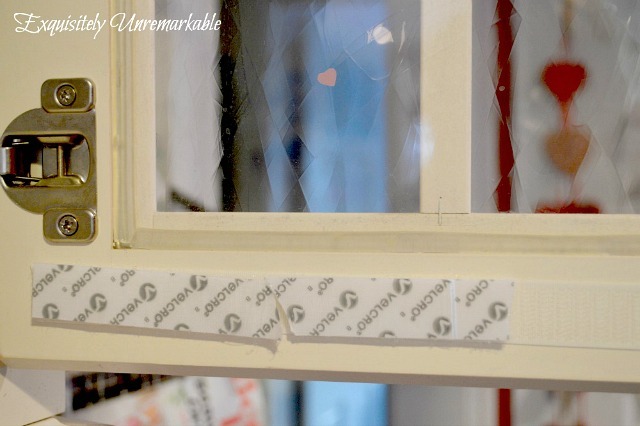 Learn how to cover glass cabinet doors with fabric with this easy tutorial. It'a super simple DIY and can be changed out easily and often! This is my office space. The area was created using the same cabinets and formica chosen for the attached kitchen. 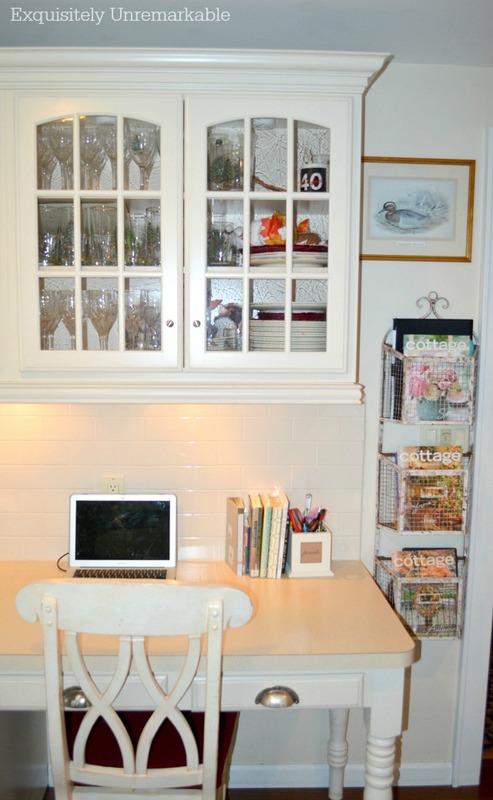 While it's great for continuity, it's not so great when trying to create a cozy farmhouse cottage nook to work in. Stock pieces and laminate countertops do not scream country charm. Well, this girl adds fabric when she needs to warm up a space. Fabric has the most wonderful transformational qualities. It softens hard edges, adds whimsy, personality and color in a way that nothing else can...and, let's face it, it's pretty. When we renovated this space, a bit over ten years ago, I added fabric to the glass doors over the desk to warm up the area. The fabric addition gave the cabinets more of custom furniture feel. It was fall when I conquered, and I use that term very loosely, this project the first time, so I went with a dark print. Now it is spring and like I said, I've been living with that fabric for a long time. 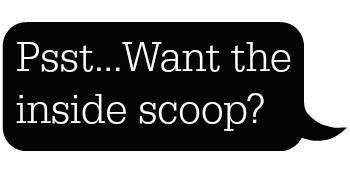 I felt that it was time to lighten things up a bit and the process is so easy and inexpensive, why not? I just love the Posy Stripe Fabric. It's very fresh. I have posted the how to on this project two other times, but in case you missed it, here it is again. I started by removing the old fabric. It was super easy. I started by measuring my cabinet doors and buying enough velcro type sticky tape to line the cabinets on top and bottom. It doesn't matter which side you stick to the cabinet. If you are a little short and have to piece it together, that's fine. No one is ever going to see it and it will stick just the same. When your door is lined and both velcro pieces are stuck together on the door, remove the protective tape, exposing the "sticky". Next, cut your fabric to one and a half times the width of the glass area. You will need the extra width to gather the fabric, so it looks shirred when you close the door. When cutting the length, make sure to add a few inches to the top and bottom so you have enough fabric to reach your velcro. I can't give an exact measurement, because it all depends on your particular cabinet and your velcro placement. Now the tricky part ~ just kidding ~ there is no tricky part here. It's all easy. 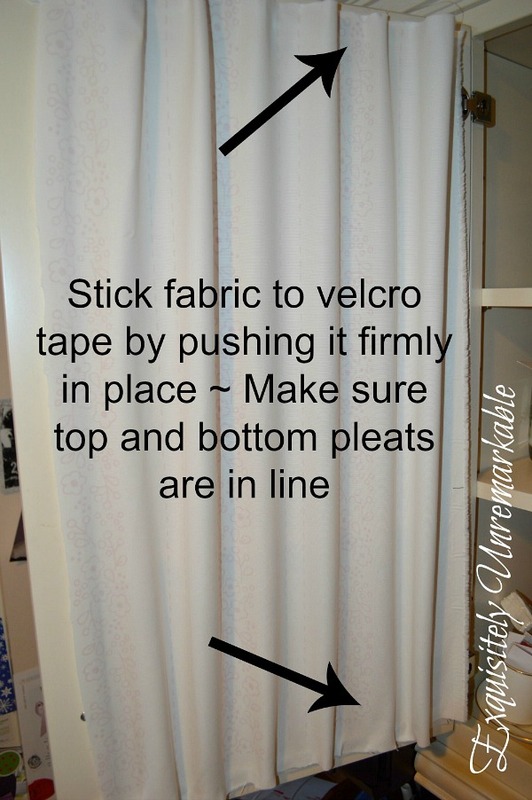 Just grab your fabric and stick it to the velcro sticky tape. I start at the top, gathering fabric as I go to create pleats. When done, I move to the bottom and do the same. I close the door a lot during this process to see how it looks from the outside and reposition it if necessary. The velcro is very sticky and very forgiving. You can move it around several times, no problem. It took me about twenty minutes start to finish to change the fabric out completely. The transformation is quite dramatic. The desk area feels cleaner, brighter and more enticing now. The flowers my husband brought yesterday look great here, too. 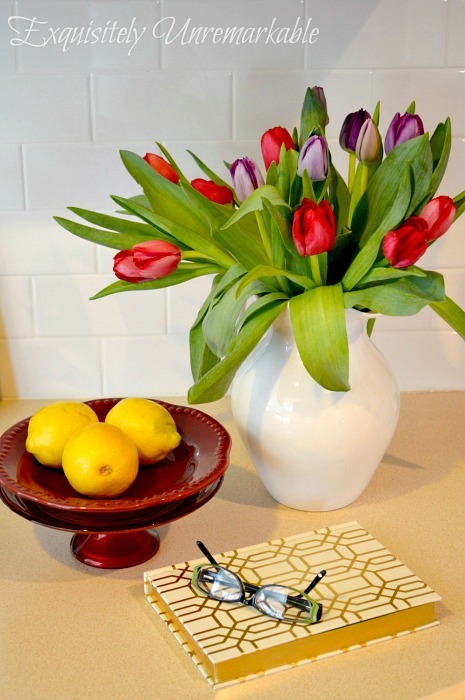 I alway keep flowers and fruit on my desk and it's always this clean and paper free. Of course, if you believe that, I've got a bridge and some real estate I'd like to discuss with you. 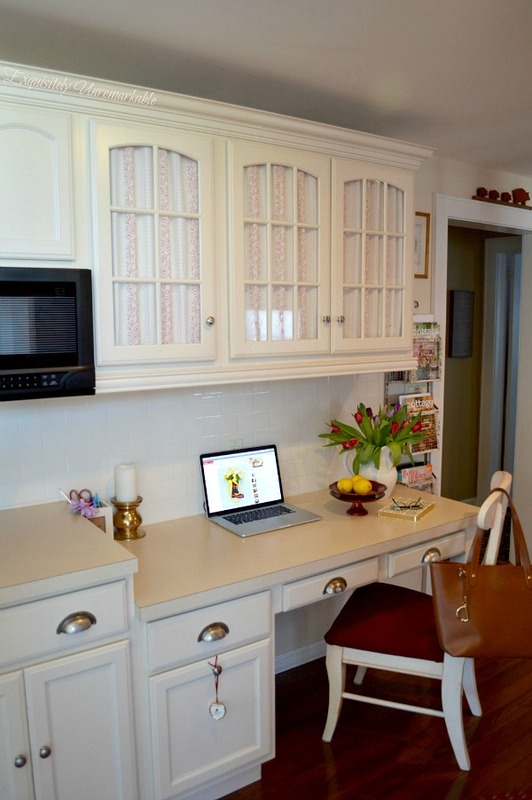 Want to see the kitchen cabinets that are not covered with fabric? Peek! If you would like to see a more detailed tutorial you can check out this post. Obviously, I have a problem with fabric! How about you? Are you a fabric junkie? Wow this is a great tutorial with your easy to follow instructions that even I could do this! Thanks for sharing the tutorial with us. Your new fabric looks great in the cabinets and perfect for spring and summer! Hope you have a nice week Kim! OMG! I am such a fabric addict! I but it even when I don't know what I'm going to do with it! 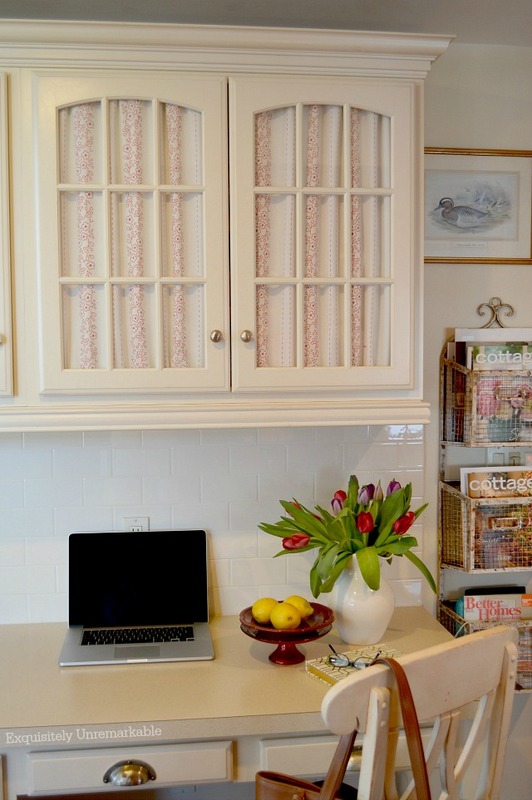 Love your cabinets with the fabric in it. Looks great! I do love fabric, but I'm no where near as creative as you are with it. Your office space look pretty with the new fabric. I would have never believed you accomplished it with velcro! Thanks Gina, It's such an easy DIY! Looks great. I like both fabrics. And if you saved them you could have a collection of them to switch out whenever you are ready for a little change. Nice. I'm working on it, Lorri! I actually gave all of my fabric away when I moved here because I just didn't have room to store it! And I'd been buying fabric for over 20 years because I quilted through my thirties. Your little spot looks nice and cozy and the fabric adds just the right touch. Thanks Brenda! My aunt was a big quilter, I used to love to go into her spare room and look her giant collection. So pretty. Your cabinets look so great with the fabric. Genius. Very pretty. I love what you do with the fabric! Fabric is so expensive nowadays - put just a bit here and there and it's a nice touch, though. I love your desk area. Wow Kim... I LOVE how the springy fabric just changed the whole look of your little space! And I have to admit the tulips from your husband are pretty amazing too! I had to giggle at your bridge and real estate joke. Who knows what lies beyond the eyes of the camera, right? and... it doesn't matter anyway. LOL! Your tutorial is great, and you've actually inspired me to do SOMETHING with all that material I've got, lol! That desk is such a catch all! The kids' papers are usually on it, along with my mail. I like the redo a lot though~ maybe it will keep me motivated to keep it clean all the time! ;) If only! Don't get me started on being a fabric junkie!! Cute way to line your cupboard doors. Love the tulips! Fabric adds such nice visual texture and warmth. I love what you did, Kim! It's lovely both ways, but it's always nice when we make a change. Maybe you need to start a cabinet fabric collection and switch it out monthly! Lol, just kidding. Or am I?? Haha! I always say that, too! Wouldn’t that be fun! Velcro is one of man's greatest invention!!!! Love the change Kim! 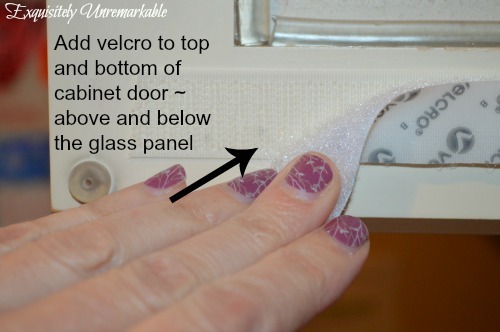 Velcro is awesome, Vel and easy! Pretty is always nice ... pretty look and pretty easy project. Gotta love that velcro! Thanks Cheryl! It is a pretty easy project. I like to play with fabric too. 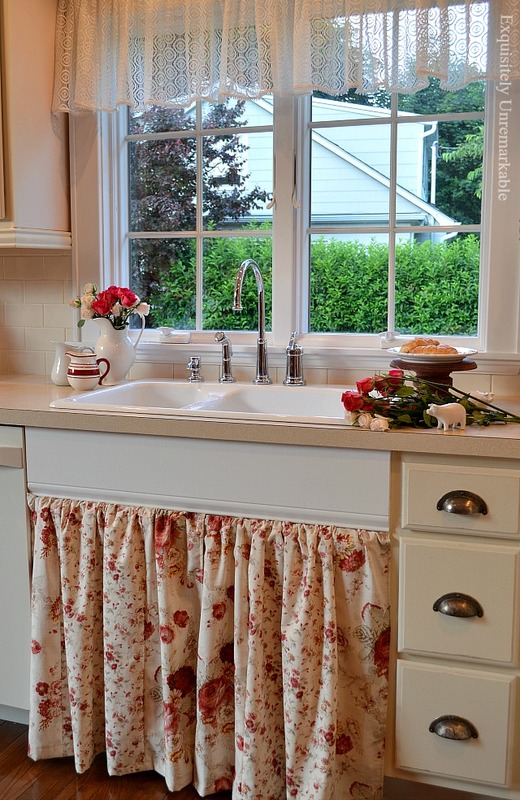 I have a curtain covering our lower kitchen cabinet by our farmhouse sink. I change up the fabric with the seasons. I also use it for decorating my garden stand. I am a fabric junkie too. Kim, very pretty fabric - being red and white, this is always true! ;) You are such a talented seamstress, not to mention, stylist - love the look you've created here for this photo shoot. You've obviously studied all those 'Cottage Style' glossies and could ace any decorating exam, I bet! Thank you, Poppy! I have a kid taking a photo class right now, so I am studying alongside. I am glad to hear it shows! Remarkable and very, very nice freshened up look! Thanks Lynne! It’s a nice pick me up after all this snow! It's very nice Kim but I'm partial to lighter colors....as for keeping the desk looking that way that's life. I do use baskets a lot which at least make it look more decorative......until the basket overflows. Thanks Ronda! I like baskets, too! I do like the new look of the cabinet very much, the fabric is lovely. And your magazine stand is beautiful. 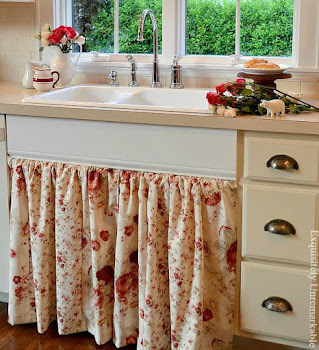 You can always use sheets...I even have a couple of vintage sheets..Also make my dishtowels out of them...Then use them for rags later when getting "raggedy" Love the way she did her glass fronts!! What a great idea! Thanks for the great suggestion and the sweet words! This is a great idea for the glass cupboard doors. We're starting to think about building a house on our property (we presently live in a mobile home with additions), and I like the idea of glass front doors in the kitchen, but I have wondered a little about the possibility of it being annoying to keep things neat and limited inside. This would provide a great option if I found I didn't like the need for tidiness in a cupboard. I would love being able to change out the fabric too, being a fabric lover. That makes me feel like we could do that and be happy with it either way. :-) Thanks for sharing it! I'm going to save it to my file of ideas. I love my glass cabinets, I have them in the kitchen where I keep them unadorned. 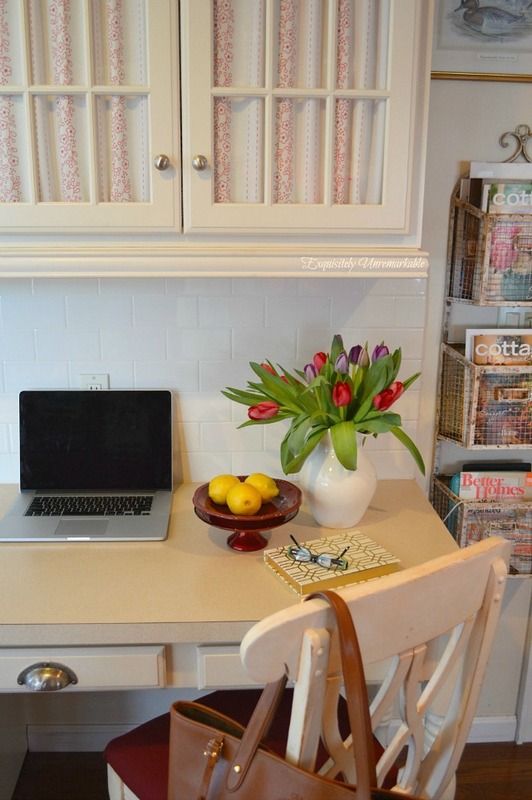 However, the cabinets over the desk have become a catch all, so covering them up was not only pretty, but functional, as well! It's the best of both worlds! The new cabinet curtains look so pretty, Kim! I really like the soft shirred look. Thank you, Carol. I really like the fresh feel they have now! I really like your desk area. It is a good combo of country and efficiency. I guess what I mean is that it is authentic. I can imagine that one actually works at the desk. I'll have to go back and check out the partially slipcovered chair - looks intriguing! I do work at the desk. I really wanted a free standing piece of furniture in the space, but this worked best! I hope you like the chair...that was a necessity after an unnamed someone did a bit of damage...ugh. I don't even want to think about fabric today...I have YARDS of the stuff all over my dining room. Eventually it will be made up into curtains, pillows, chair cushions etc., for the dining and living rooms. At this moment it is being used as a hidey hole for a certain princess cat! She has been having a ball jumping in and out! Thanks J! I love fabric…I just have a thing for all the color and texture. Right now I am wrestling with my sewing machine trying to scrap together a new curtain out of the old panels from the glass cabinets. It’s slow go and I don’t have a kitty friend to entertain me! :) Good luck with your projects! Exactly, Kim...and trust me, the insides are not perfect!! ;) Not even close! What a wonderful and simple way to enliven spaces. I must confess that my desk seldom looks as neat as yours. How do you do it? I love how you have added the fabric to those glass cabinet doors. Thanks so much for sharing at my Show and Share Party. I really do try to keep that desk clean, Rue, but it just doesn't happen. It's a giant catch all. 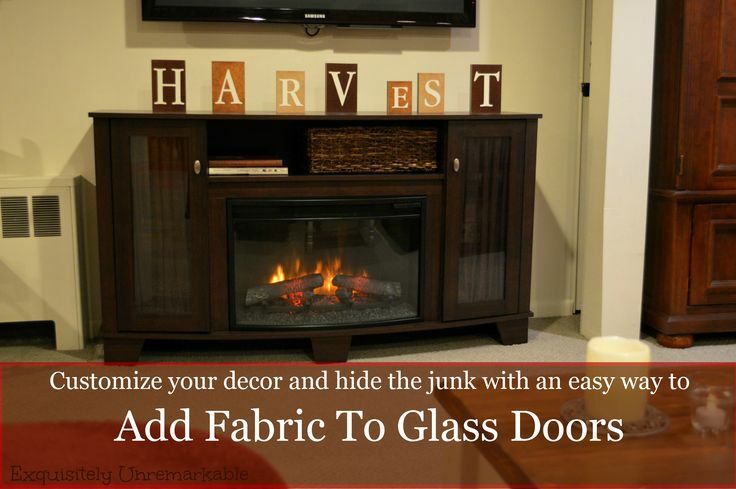 What a great way to add fabric to your cabinet doors. 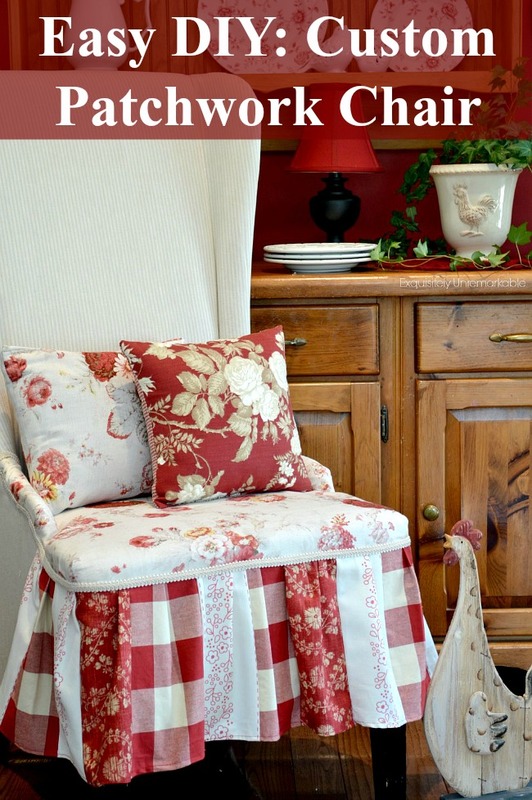 I have a hutch that I have been wanting to add some fabric too and now I know how to do it. Thanks! Love the Spring update on the cupboard doors. You've created a lovely space! Thank you, Carolyn! It was an easy update, for sure! I like wood and leather, too, Kathy. I also like color and lots of it. I do have white in my kitchen but it is accented by red walls, dark flooring and wood pieces. I have tried the all white look and it's just not me! Wow, the fabric behind the cabinets looks really nice! Great job. I'm visiting from the Over40 FB group - nice to meet you! I love this idea, and I see you've used fabric to decorate other items in your home. You're so creative! Saw your link at DIY Party. Kim I love this idea using the fabric with velcro was genius. And you can change it out so easily. Thank you, Mary! Have velcro, will cover!! And it's cheap too!! I Love this idea, so going to try it..
an from what little I can see, I also like what you've done off to the side. Would it be possible to see you magazine bins.. THAT also is SO Genius!! Hey Kim. Thanks for the reminder of this lovely fabric cheat. You know me - I'd use my sewing machine to make neat gathers and perhaps even sew a strip of fabric along the gathers to keep them in line and easier to pull tight. I always overthink projects! You do it so much easier! Wish my cabinets were glass. I love fabric and your idea is so pretty. Maybe I can find someone to put glass in my cabinets. Thank you for your pretty ideas ! I have seen people do that. Usually the center panel from most cabinets can be removed and if you can't find glass you can have it cut. It might be pricey, but for a few cabinets, it might be worth it! Good luck and thanks for the comment! Thank you so much! Tulips are my favorite!